No other service makes sharing videos faster or easier. No other web meeting service includes a powerful Video Postcards studio for your business. You can use a custom background image, banner, links, personal message and an automated call-to-action URL redirect. Automatically open a web page at end of your video. Share/post your Video Postcards online. Videos play on ALL mobile devices. Sign-Up NowSee It In Action! 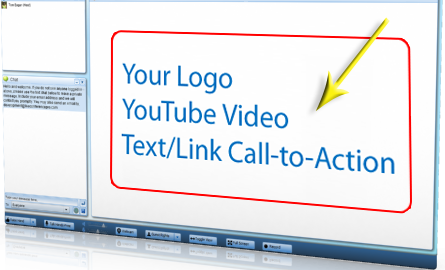 Display your logo, YouTube video, text and call-to-action link in the main area of your meeting room. You can change the meeting room language, interface color, set default text in the chat pod, display a business card image and other settings which make a memorable, professional, and personalized impression. You can easily update your branding options at any time from the Host control panel. 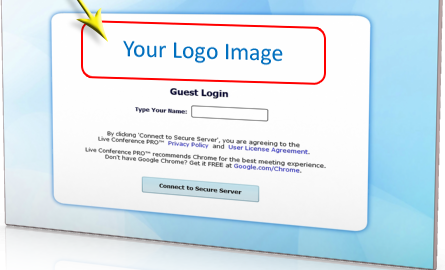 Displaying your logo or other image on your guest login page tells people they have reached the right location for your meeting. Organize files and folders to share with everyone or specific people in your live meeting. You can choose to allow people to download files without being logged in to the meeting. You will love the convenience of this tool. Share your entire screen or a specific area. Show and edit documents with meeting participants. Demonstrate any program or share a view of a photo album. NOTE: Unlike our competitors, you can show and annotate on PowerPoint presentations, using our Present Slides tool without bandwidth-heavy screen sharing. Show YouTube videos during your meetings. Guests who arrive late are automatically synchronized and this includes those attending via a mobile device. Show, annotate and use a pointer on PowerPoint, PDF and Word Docs in your live web meetings. Uses a fraction of the bandwidth required by other services. Guests can attend your meetings – from anywhere by installing the free meeting app, then type a 5 digit code for your meeting. People can join your meeting on a 3G or 4G data connection! Wi-Fi is better, but not required. Includes: Text chat (private and public), VoIP audio, webcam, PowerPoint slides, synchronized video and file sharing. © 2001-2017 Live Conference PRO™ - Live Conference Pro, LLC. All Rights Reserved. Note: Before you enter the web meeting, you must have the 5 digit Access Code which will be provided by the meeting Host. The Host can see this Access Code in the top right corner of their screen when they are logged into their room.